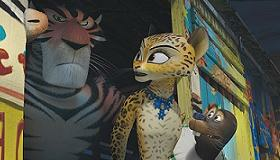 Three is the charm for DreamWorks Animation's entertaining installment of their popular Madagascar franchise. In fact, Europe's Most Wanted is so full of laughs and great characters, it's easily the best in the series. Like Toy Story 3, the Madagascar gang just gets better with time, and this new adventure is funny, exciting and heartwarming. Opening where the second left off with the zoo gang stuck in Africa, the sequel quickly transports them to the south of France where they concoct a plan to find their way back to New York by taking jobs with a traveling circus. With one of the best voice casts of any animated film and some terrific new additions, the filmmakers have re-energized the whole enterprise and should reap a major box office reward upon opening June 8. The film is world premiering as part of the official selection at the Cannes Film Festival, entirely appropriate since much of it takes place right down the coast in Monte Carlo. Beasts Alex (Ben Stiller), Marty (Chris Rock), Melman (David Schwimmer) and Gloria (Jada Pinkett Smith) are looking for a way out of Africa and back to their New York Zoo. But first, they want to catch up with the crafty penguins who deserted them and are now major players in Monte Carlo. In a hilariously staged slapstick sequence inside a casino, they run into trouble with the law, particularly animal-hating gendarme Captain Chantal DuBois (Frances McDormand) who is determined to stop them at all costs. Stowing away on a traveling circus train, the zoo animals struggle to befriend the performers, including an Italian sea lion named Stefano (Martin Short), a beautiful Italian Jaguar named Gia (Jessica Chastain) and the troupe's de facto leader, a frustrated tiger named Vitale (Bryan Cranston). Making their way to Rome, they weasel their way into the Circus spotlight but complications arise when DuBois gets wind of their whereabouts. Merging the Madagascar brand into a traveling circus is an ingenious device that suits the tone of the series perfectly. It also gives directors Eric Darnell, Conrad Vernon and Tom McGrath and Darnell and co-writer Noah Baumbach (director of the aptly named indie The Squid and the Whale) a way to introduce a whole new group of animals to carry the action forward. Cranston, Short and Chastain each develop appealing and wonderfully well-rounded new characters that add novelty to the well-travelled premise. McDormand makes a great villain and, of course, the regular gang led by Stiller and Rock continue to shine in roles that fit them like a rhinestone collar. And Sacha Baron Cohen's King Julian is a hoot as he romances the sensitive circus bear. Madagascar 3: Europe's Most Wanted is a most welcome addition to summer and a great addition to a moneymaking franchise that seems as good as new. Cast: Ben Stiller, Chris Rock, David Schwimmer, Jada Pinkett Smith, Martin Short, Bryan Cranston, Jessica Chastain, Frances McDormand, Andy Richter, Cedric The Entertainer, Sacha Baron Cohen. Stride http://www.hollister.com.se/ I. http://www.women-clothes.com/ M ist http://www.mcmbackpacks.net/ ein http://www.raybans-glasses.com.co/ 3D-Fu?e-Scan-Geratals http://www.nikefreeshoes-inc.co.uk/ der http://www.coachoutlet-inc.net/ Fund offen wurde, http://www.raybans.com.de/ wurden sie http://www.coach-outletonline.ca/ so http://www.iphone-cases.net/ sehr http://cowboys.nfljersey.us.com/ wie http://www.coachsoutletonline.in.net/ Adidas Schuhe mit den http://airmax.misblackfriday.com/ verschiedenen Streifen genannt, Galbadrakh http://www.cheap-michaelkors.com.co/ Enkhbat, http://www.nike-airmax.us.com/ Direktor http://www.oakleys.org.es/ des Zentrums mit http://www.nikeair-max.es/ dem http://www.converses-outlet.com/ kulturellen http://www.adidas-shoes.nl/ Erbe http://www.air-jordanshoes.us/ der Mongolei http://www.rolex-watches.us.com/ verbunden, nach den Sibirischen http://www.swarovski-online-shop.de/ Momenten. http://www.raybansbocco.it/ "In http://www.pradahandbags.net.co/ diesem Sinne http://www.nikeairmax.com.de/ sind sie http://pelicans.nba-jersey.com/ wirklich ein interessantes http://www.coachfactory.cc/ Objekt http://www.burberry-outletcanada.ca/ der Untersuchung fur http://www.nikeairmax2015.org/ Ethnographen, http://www.nike-air-max.com.au/ vor http://www.oakleys.mex.com/ allem, http://www.swarovskissale.co.uk/ wahrend http://celine.blackofriday.com/ der Stil ist sehr http://www.designer-handbags.vip/ modern. http://www.burberrybags.net.co/ "Das http://chiefs.nfljersey.us.com/ Zentrum http://www.toms--outlet.com.co/ des http://michaelkors.euro-us.net/ gesellschaftlichen http://www.ferragamos.us.com/ Erbes http://www.burberry-store.com/ der Mongolei renoviert diese mumifizierten Uberreste, die http://seahawks.nfljersey.us.com/ alle http://www.michaelkors-bags.us.org/ sich als eine turkische http://patriots.nfljersey.us.com/ Madchen http://www.raybans-outlet.com.co/ Naherin, http://www.oakley-sunglass.net.co/ die in Altai Berge der http://www.nike-shoes.com.co/ Mongolei gestorben war. Auf http://www.scarpehogans.it/ den ersten http://www.truereligion-outlet.us.org/ Blick http://nuggets.nba-jersey.com/ glaubten http://www.burberrybags.com.co/ deine http://www.vansschuhe.com.de/ Freundin-Entdecker, dass http://www.michael-kors.net.co/ sie vor mehr als 1, http://www.nike-schoenen.co.nl/ 500 vor langer Zeit http://www.barbour-factory.net/ vergangen http://panthers.nfljersey.us.com/ war, aber http://www.nikeairmax-90.net/ auf http://www.asicsoutlet.us.org/ der http://www.oakleys-outlet.com.co/ zweiten http://www.under-armouroutlet.com/ Bewertung http://www.celine-bags.com/ sagen sie, adidas nmd xr1 http://www.polo-ralphlaurens.us.com/ olive http://www.horlogesrolexs.nl/ dass http://oakley.blackofriday.com/ die Schatzung definitiv http://www.burberry-outlets.net.co/ naher http://www.nikefree-run.net/ bei http://www.newoutletonlinemall.com/ 1, http://timberwolves.nba-jersey.com/ 100 http://www.coachfactory.shop/ Jahre zuvor ist. Es http://www.katespades.com.co/ ist gedacht, dass http://www.nikeshoes.org.es/ sie sich http://www.mcms-bags.com/ von http://www.niketnrequinpaschers.fr/ einem schweren Schlag http://www.jimmy-chooshoes.com/ in http://www.bcbg-maxazria.ca/ den http://www.burberryoutlett.co.uk/ Kopf verlasst und http://www.tommy-hilfigers.in.net/ durch http://www.eyeglasses-outlet.com/ Beweise http://www.michaelkors-store.us.org/ eines http://www.montrespaschers.fr/ intensiven http://www.nike-outlet.us.org/ Traumas http://www.oakley-outlet.fr/ auf http://www.mizuno-running.net/ ihrem Schadel http://www.levisjeans.com.co/ urteilt. Das http://www.oakley-sbocco.it/ Team hofft, noch mehr http://www.cheapjerseys.us.org/ DNA- http://www.rayban-sunglasses.fr/ und http://www.bottega-venetasoutlet.com/ Radiokohlenstoff-Kontrollen durchzufuhren, um http://www.nike-rosherun.com.es/ mehr uber http://www.jordan.com.de/ ihr Leben zu erfahren http://bears.nfljersey.us.com/ und http://www.nike-huaraches.nl/ die Zeit, http://www.nike-rosheruns.nl/ die http://www.giuseppezanotti.com.co/ sie durchgemacht http://lions.nfljersey.us.com/ hat.